A recent report by the New York Civil Liberties Union revealed that the New York Police Department stopped and frisked nearly 700,000 people last year. Black and Latino youth were the primary targets of these policing efforts. Black and Latino males between the ages of 14 and 21 accounted for 41.6 percent of stops in 2011, yet they make up less than five percent of the city’s population. Ninety percent of Black and Latino young men who were stopped were innocent. The disproportionate targeting of black and Latino young men in New York City can help us to understand another phenomenon: why 98 percent of deportees are sent to Latin America and the Caribbean and why over three quarters are male. In my research with Dominican and Jamaican deportees, I found that the vast majority of them were first picked up by police officers and then handed over to immigration authorities. If you walk into an immigration detention center today – where an average of about 34,000 non-citizens are held as they wait on immigration hearings and for their deportation to happen – you will find that nearly all detainees are black and brown men. This is remarkable, because not all immigrants are men, and not all immigrants are from Latin America and the Caribbean. About 25% of undocumented immigrants are from Europe and Asia. And about half of all immigrants are women. So, how is this happening? 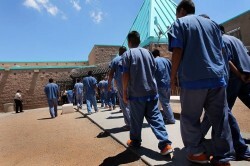 Why are most detainees and deportees Latin American and Caribbean men? The answer to this question lies in racial profiling. As immigration law enforcement increasingly is being carried out by criminal law enforcement agents, the effects of racial profiling in criminal law enforcement have spillover effects into immigration law enforcement. Deportations are carried out by immigration law enforcement officers who work in two branches of the Department of Homeland Security: Customs and Border Patrol (CBP) and Immigration and Customs Enforcement (ICE). In Fiscal Year 2010, immigration law enforcement agents apprehended over half a million non-citizens. The vast majority – 463,382 – were apprehended by the Border Patrol. The remaining 53,610 were encountered by ICE, usually within the interior of the United States, in cities such as Chicago, Atlanta, and San Francisco. Border Patrol arrests happen much as they have since the creation of the Border Patrol in 1924, except that there have been enormous technological advances. Border Patrol agents have checkpoints and helicopters and motion sensors and all sorts of ways to find people along the US/Mexico border. They also have racial profiling, a central technique in immigration law enforcement along the border for the past 90 years. Thus, it should come as no surprise that Mexicans account for the vast majority of arrests along the Mexican border. In addition, the presumption of illegality has also spread to nationals of Mexico’s southern neighbors in Central America. Thus, the second largest group to face deportation is Central Americans. However, there is a third group that also faces deportation in large numbers: Caribbean immigrants from the Dominican Republic and Jamaica. Notably, Dominicans and Jamaicans, unlike Central Americans, are not likely to be stopped along the border for “Mexican appearance.” So, how are they getting caught up in the deportation dragnet? When I spoke with Dominican and Jamaican deportees, very few of them reported having been arrested by immigration agents along the border. Nearly all of the Jamaicans and Dominicans I interviewed had arrived in New York City via airplane. Immigration law enforcement agents generally do not have license to walk up and down the streets of U.S. cities and demand proof of U.S. citizenship from pedestrians. The Border Patrol is only authorized to work in U.S. border areas. And, ICE, only has 20,000 employees overall, only a fraction of whom are officers engaged in raiding homes and worksites arresting illegally present immigrants. ICE does not have the staff or resources to patrol the county. Instead, ICE works closely with criminal law enforcement agencies to apprehend immigrants. 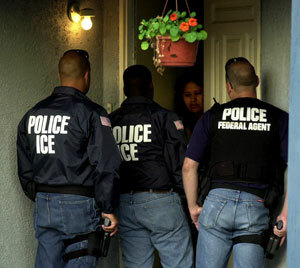 Enforcement and Removal Operations (ERO) is the division of ICE that carries out arrests. On an average day, Enforcement and Removal Operations (ERO) officers arrest 108 immigrants, and deport 1,057 people. ERO officers arrest many of these 108 immigrants per day after they have been processed through the criminal justice system. A police officer pulls over a person for an alleged traffic violation. If that police officer is deputized to work for ICE, they can run the driver’s fingerprints right there on the road. If the driver turns out to be illegally present in the United States or has an immigration hold, the police officer can arrest the driver and hand them over to ICE. A police officer arrests a person and charges them with a crime. They take them to the police station, fingerprint them, and then run their fingerprints through the ICE database. Even if the police decide to drop the charges, if the person turns out to have an immigration hold, they will detain them until ICE comes to pick them up. A police officer arrests a person, charges them with a crime, and the person serves time in jail or prison. Before being released from jail or prison, the police can call ICE to come and check their eligibility to remain in the United States. All three of these scenarios begin with a police arrest. We know well from criminal justice scholarship that black and Latino men are much more likely to be arrested than other people. The cooperation of police with ICE, then, leads to an expansion of this racially stratified system of punishment into the realm of immigration law enforcement.